So I spent Mother’s Day caring for a posse of children ranging from five to nine in numbers. Breakfast in bed? Ha ha! I made brunch for six kids. But you know I loved it. My BFF’s two daughters stayed with us for the weekend. They are 11 and 9, and they have become friends with the 11-year-old next door and her older brother. Add in my kids’ other two friends, and there was a whole bunch of them playing outside all weekend. My husband bought a slew of water guns, and they all just ran around spraying each other, climbing in the neighbors’ tree and banging in through the back door to change into costumes or grab food. The girls are wonderful with my kids: they carried them piggyback through the park when we went to my son’s baseball game and entertained them while I cooked. The 9-year-old cooked the eggs for the brunch. 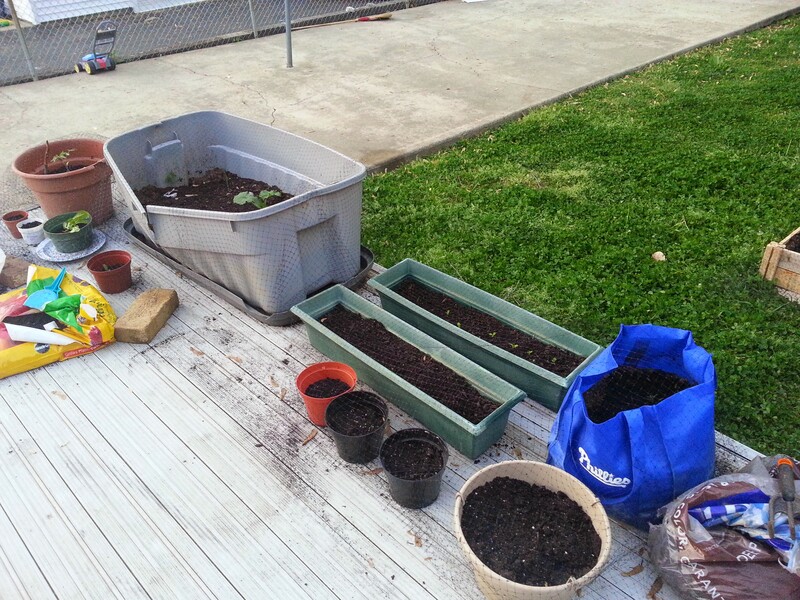 She also planted a whole bunch of seeds for me: cilantro, four o’clocks, zinnia, red peppers, basil. 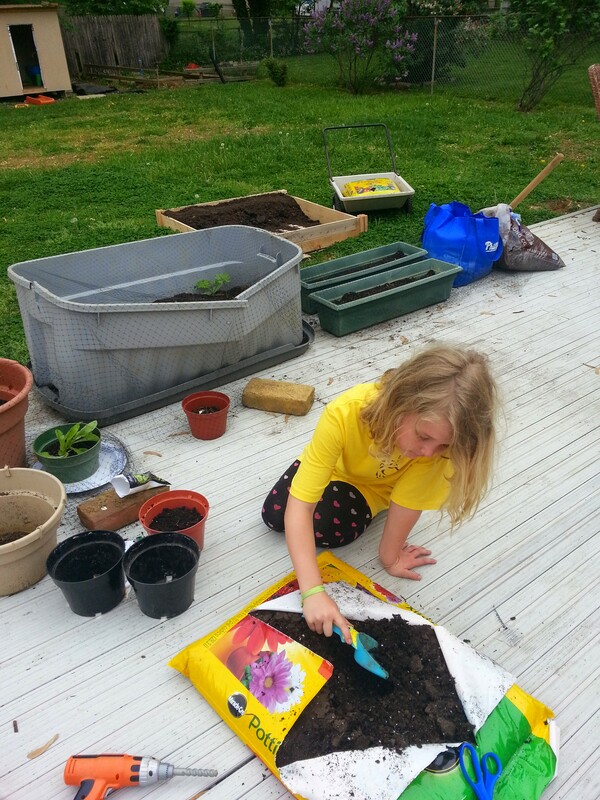 It was great to have half my gardening work for the weekend done, but more importantly it was nice to have a kid around who was excited about gardening! Sigh. My kids are mostly over it. I didn’t receive any hanging baskets, so I’ll probably go ahead and buy a few. The front porch needs color. 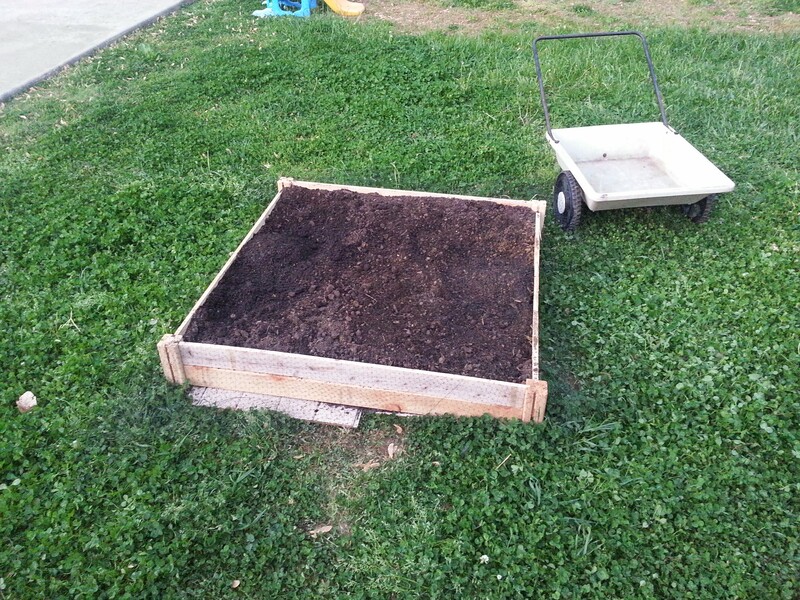 Friday night/Saturday morning, I put together the raised bed and filled it. I think $45 is too much to pay, but it was super easy to put together, so I’m a fan. Last night I planted two hills of pumpkin seeds inside. Find out when to start spraying the pumpkin leaves with that milk concoction to prevent powdery mildew. 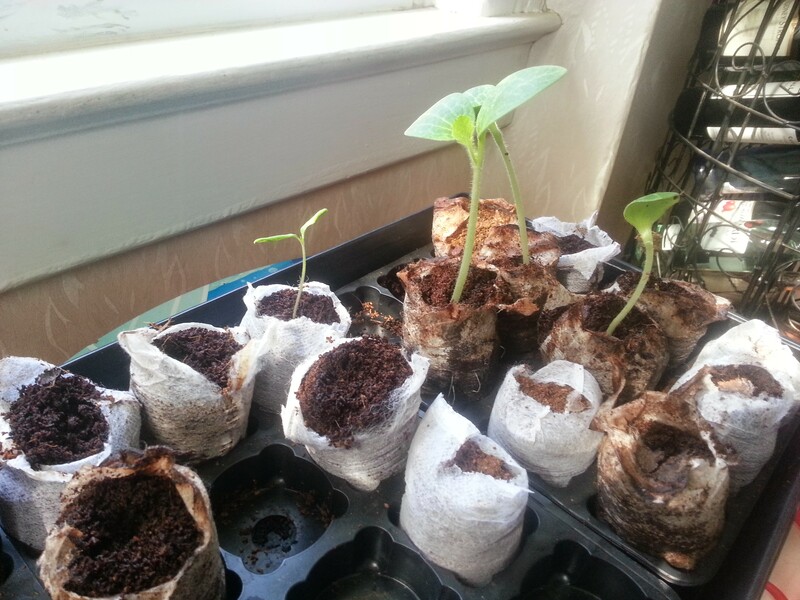 Plant the remaining seedlings — not sure yet where or in what. Figure out if I am supposed to be fertilizing, and with what. Figure out if I will need to pollinate the pumpkin plants at some point. So to recap, the garden contains or will soon contain two types of pumpkin, two types of romaine lettuce, corn, carrots, onions, tomatoes, yellow squash, cilantro, basil, zinnias, four o’clocks, and sunflowers! Just keeping all that watered is a j-o-b. And it hasn’t rained in forever! Next year I will have a big pile of soil delivered. Getting tired of going back to the hardware store for bags of dirt. On the groceries front, my Wegmans trips are going pretty well, although a lot of impulse purchases keep getting in the cart. I have been cooking, but the heat (88 degrees today!) is starting to get to me. Last week I cooked every night except Thursday (pizza). Friday was a mish-mash of meals, designed to use up certain items. Thrifty, but I felt like I was in the kitchen forever. 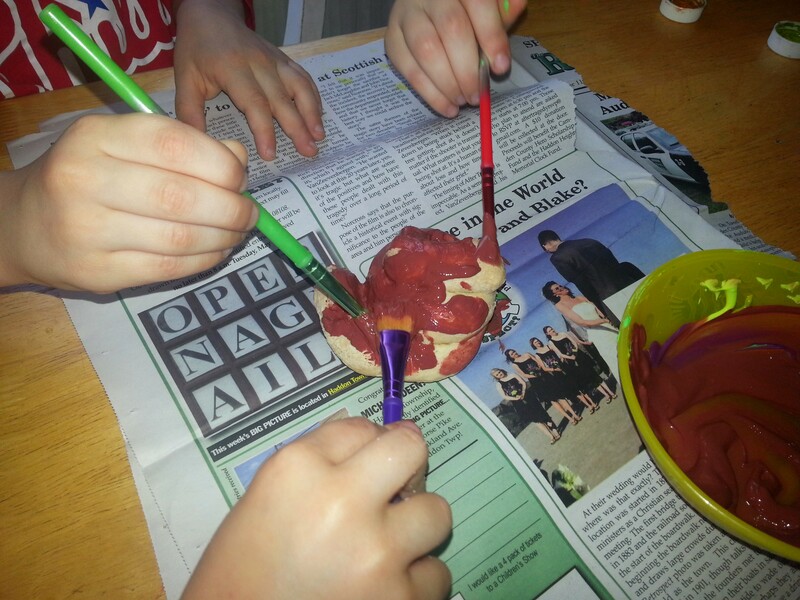 While I was doing that, the kids painted the fake poop we made. Let me tell you, that fake poop provided hours of enjoyment. This week: PTA meeting this afternoon, making a dessert for the teacher appreciation luncheon tonight, volunteering at library checkout tomorrow, baseball practice tomorrow night, my younger son’s spring show Thursday night (for which I have to procure a ’50s-type outfit), and a baseball game Friday night. Tonight, there is a plant/seed swap I’d like to go to, but it’s doubtful.